Over the past several years, we’ve been seeing a subtle shift in our consulting work at Strativa. Years ago, clients would ask us to facilitate an ERP or CRM vendor selection, a business process improvement project, or various types of IT assessments. Our consultants still do those types of projects, of course. But today, increasingly, clients are asking us to help them in a more holistic way. Increasingly, they are not just looking for a new system or for business process improvement. They are looking to see how new technologies can enable new business models, how they should rethink their whole applications portfolio to support changes in their businesses, and how they should redesign or simplify business processes to take advantage of new technologies. We attend a number of vendor conferences and analyst briefings every year. Our goal in attending these events is primarily to keep up on the latest capabilities of each vendor, so that we can best qualify them for short listing for our clients. As much as vendors like to talk about business transformation, most of what we see at vendor events is more narrowly focused on features/functions of vendor products. The best try to inspire their customers about the vendor’s product road map. The worst are just sales events, with networking opportunities and parties thrown in. One vendor that is breaking the mold this year is Microsoft. Unlike previous years, Microsoft is no longer positioning Convergence as a conference for customers of Dynamics, Microsoft’s business applications group. In fact, on the Convergence website shown in the screen grab to the right, the word “Dynamics” scarcely appears. 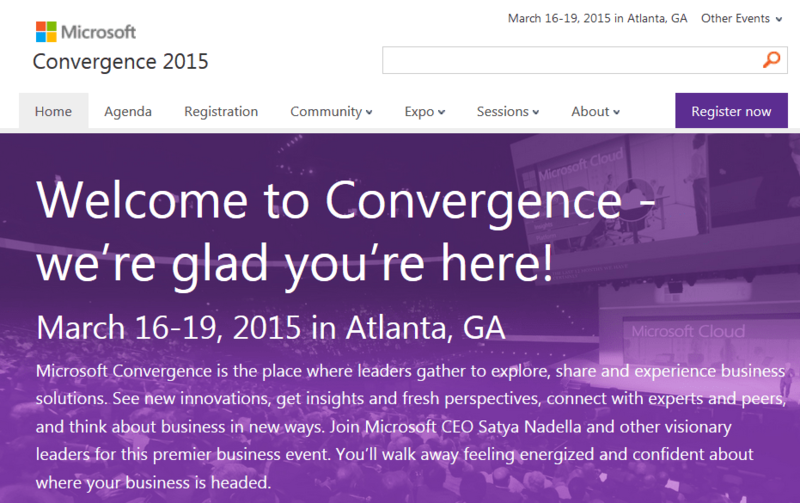 Convergence is now Microsoft’s “premier event for business,” as CEO Satya Nadella explained in his keynote. What does he mean exactly? It’s that Convergence now focuses on the entire portfolio of Microsoft technologies, as they apply to business organizations. Not only was this apparent in Nadella’s keynote: the message also came through in the customer presentations and case studies during the rest of the conference. The best example was the customer panel for media and analysts, offered on Tuesday morning. There were six panelists: Don Butler from Ford, Casey McGeever from AccuWeather, John Buccola from from WASH Multifamily Laundry Systems, Mushtaque Ahmed from JJ Food Services, and Philip Kennedy from Pandora Jewelry. Ford, with its connected car initiative using Microsoft’s Azure cloud. Examples soon to be realized: Use your smart phone to check whether your electric vehicle is fully charged. On cold days, use your smart phone to schedule your car to turn on its engine a few minutes before you want to leave, so it’s warmed up before you get in it. Or, if you forget where you’re parked, use your smart phone to “find my car.” Ford will also use Microsoft Azure to distribute software updates over the air, replacing the current USB method. Ford also runs Microsoft Dynamics as part of its customer service systems and will ultimately integrate them with its cloud-connected services. AccuWeather, which uses Microsoft Azure to serve up 9.5 billion weather requests a day. The scalability and flexibility of a cloud infrastructure is critical for AccuWeather, where demand can spike many fold when a major weather event takes place. There’s more on this blog post. WASH Multifamily Laundry Systems, which uses Microsoft Azure to collect and analyze data from 500,000 washers and dryers as the basis for decisions on pricing and service. The company also uses Dynamics CRM, Dynamics GP, Office 365, PowerBI, and plans to leverage Azure ML (Machine Learning) in the future. This YouTube video gives an overview. JJ Food Services, which uses Azure ML as part of its online customer order system (based on Microsoft Dynamics AX) to predict and recommend other products to customers as they fill out their shopping carts, based on each customer’s past order patterns. In effect, JJ’s system predicts the customer’s shopping list before the customer shops. Pandora, which deployed Microsoft Dynamics CRM along with Microsoft Azure to build a B2B portal from the ground up for its franchisees, allowing them to place orders and gain access to marketing materials and product information. It also built an Azure-based self-service reporting portal, supporting 35 countries. Finally, it implemented a global contract management solution in Microsoft SharePoint Online. There’s more on this blog post. The customer panelists at Convergence, in contrast, were really talking about business transformation: not just how IT supports business strategy, but how business strategy is enabled by innovation in information technology. It’s not just about IT helping the organization do things better; it’s about technology enabling the organization to do business differently. This is where Microsoft wants to play—not just in the IT organization providing business systems for the users of IT. Microsoft wants to provide technology that makes a strategic difference to the business organization as a whole. To do that, Microsoft can’t limit its story just to Dynamics applications: it has to bring its whole portfolio of technologies to its business customers. Not all attendees welcome this broadened focus, however. In hallway conversations, some attendees complained that the number of Dynamics-specific breakout sessions was cut back in favor of more general business presentations. But there is no need for an either/or dilemma. In the new scheme, Microsoft plans to use other conferences through the year to offer a deeper dive for IT professionals. Nevertheless, for those of us who need to understand how Microsoft technologies fit into our clients’ strategic IT roadmaps, Convergence is now a much more interesting event. This entry was posted in IT Strategy and tagged Microsoft, Microsoft Dynamics. Bookmark the permalink.